Noob’s return to Tracking important matches for rolls on! This weekend, trying out something new. What follows are the most important matches from the top 20 leagues in CONCACAF. Enjoy, as we get to know leagues and clubs from all over our local federation. Cruz Azul were the regular season champs! But they lost in the Liguilla (postseason tournament) final to #B CF America. They sported the best defense in the league, should be a contender once again. UANL finished in 6th, also qualifying for the Liguilla. Their goal differential was second best in the league, but it wasn’t bad luck that kept them from a higher table position. They struggled against top competition, if often losing close at least. And they ran up scores against lesser foes. They’ll need to figure out how to get more scoring versus the real contenders if they want to join their ranks. CONCACAF league rank: hmmm…well, nowhere near as good as U.S.
Mexico’s professional women’s league has their season divided the same as the men’s side. In this league also they are just starting the Clausura. Unlike the men’s side, the women’s league is divided into two Groups of nine clubs each. Top four from each make the Liguilla, and these two were both in it. These two were the best defensive teams from their Group. They sported the best two defense in the league. Both will have to show they can score a lot more in order to challenge Group champs UNAL. The Number B image originally shown here was redacted. I blame the agents of worn-out Number Two. Previously, Noob has paid little attention to second-tier Mexican football. And while I may not spend a lot of type on it, as perhaps the third-best league in the region, we’ll get to know it a little. There were just two or three teams in real contention for the regular season Apertura title. But that liguilla is just as shiny a trophy, and it was the #5 seed that won it. Oaxaca’s got the goal-stopping ability to make a push higher in the table here in the Clausura. Sonora’s got to win some close games this go-round or they won’t. It’s worth noting, kind of sadly, that these clubs aren’t really offered a chance at Promotion into Liga MX. The overall winner is technically eligible, but there are safeguards in place so the last place Liga team can pay a bunch of money to stay in the top flite. Fun Fact: Oaxaca’s nickname – The Alebrijes – is a term for art depictions of fantastical creatures. The form and term comes from artist Pedro Linares. After falling ill, he had dreams of unreal animals and drew them upon waking. I assume a rough correlation between a national team’s official ranking and the country’s domestic league strength. I’ve never found formal rankings for the latter. This year, countries with professional and semi-professional leagues can send two teams to the new Caribbean Club Championship. 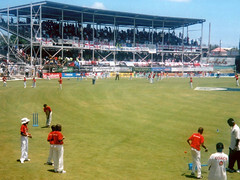 Other countries’ leagues can send their winners to the second-tier Caribbean Club Shield tournament. The particulars of how each event qualifies teams to the CL and CONCACAF League can wait for another day. Last year, this 12-team, league played a double round robin. This year, they’ve just reached that point and are playing on! But it’s not the playoffs. Currently, this league is seeing a three-horse race for those top two spots. Portmore – which made the Caribbean Club Championships last year – have a narrow lead, but their defense is suspect. Fortunately for them, Mount Pleasant is a small-ball team – don’t score much, don’t concede many. Noob is looking for comments on what the interjection means. Actual part of the Academy crest. French Guiana could send two teams for the Caribbean Club Shield, but is not. Maybe after this season. Agoaudo are undefeated, lead the next team in the table by nine points. That’s not quite as big a gap as it looks like at first glance. This league awards four points for a win, two for a draw, and one for just showing up. Second-best offense in the league, runaway best D.
Kouro are merely midtable. Noob’s not certain they have the D to maintain a top-half finish in this 12-team league. Fun Fact: Nearby Agoaudo’s home of Apatou is the Guiana Amazonian Park. Suriname is a French department (state, more or less), and this park is the largest French national park. Guadeloupe are sending 2017-18 their champs – Moulien – to the Club Shield, unlike French Guiana. That same club leads the league this year, too, but what a race it looks like so far! They lead the next team in the table by just a point, and three other clubs are within just five points. Moulien will try to keep the score low. Not that they can’t score well themselves, but #3 (and likely true top threat for the title) USBM prefer a wide-open style themselves, and would play it far better. RESULT: USBM 0-3 There’s your new league #1! Three teams trail by just a single point in the table. As a former radio dj, just thought this was cool. Village Superstars are the defending champions, will play Club Shield. They lead the league this year as well, but their hosts today and Newtown United are going to both be there ’til the end. These two sport excellent offenses, but lead the league in D. It will be interesting to see what sort of pace St. Paul’s will try and dictate at home. The season looks to only be 18 matches long here in the former Netherlands Antilles. So even at seven matches in, things are looking serious. Unbeaten Scherpenheuvel have opened up a five point lead over UNDEBA. But this is a good matchup for the visitors. They score goals like crazy, but play about no defense. But scoring is exactly where Inter struggles. Curacao will host the Club Shield. Jong Holland are the defending champs here, but deep down the table this season. RESULT: Inter 2-1 The winners climb into a three-way tie for 4th place. The losers fall into a tie for #B in the table, six points behind the league leaders. Robin Hood are the defending champs, representing the league in the second-tier Club Shield tournament. They are one of three still undefeated teams here in 2018-19. They trail Leo Victor by four in the table. The real question in this league would seem to be will Inter Moengotapoe (3rd place) be able to keep pace? So far offensive numbers say no. But it’s early. They should beat midtable West Utd. in their own house by a couple today. Fun Fact: West Utd. are from the Coronie District, of which the four towns have fewer than 4,000 people. It may just be the halfway point, but there are also just nine match days remaining. Parham are just five out of the lead, but it feels like they have too many clubs to leapfrog to make a title run. Grenades are just three back of the defending champs – Hoppers – and have the defense to stay in the race. This could be a tricky home game though. Parham are something of a traditional power here. RESULT: Grenades 1-0 Grenades climb to #B, Parham slip to 6th. So long from the Antigua Recreation Ground in St. John’s, home of Grenades F.C. !